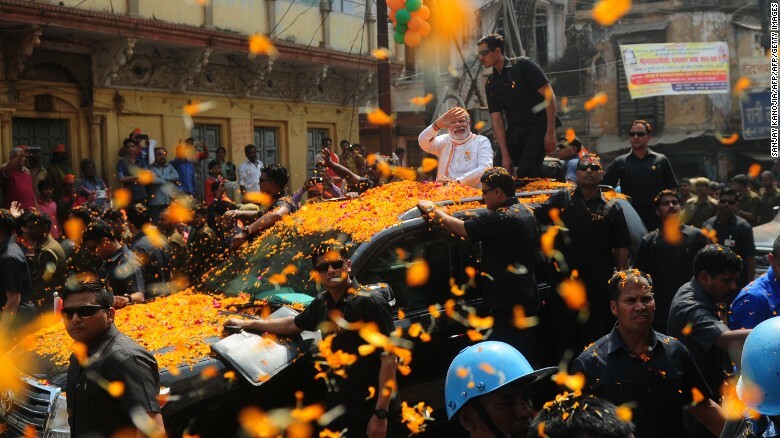 Indian Prime Minister Narendra Modi during a roadshow in support of state assembly election party candidates in Varanasi on March 4. New Delhi (CNN) India’s ruling political party has won a crucial state election, strengthening its ability to push through a development agenda in the world’s fastest growing major economy. As vote counts trickled in from five state elections on Saturday, one result loomed large: that of central India’s Uttar Pradesh, home to more than 200 million people. The staggered five-week vote in that state alone marks the biggest election in the world in 2017. Modi’s ruling Bharatiya Janata Party, or the BJP, looks poised to take about 75% of the 403 seats on offer in Uttar Pradesh. The clear majority means the BJP will be able to form a state government without the help of other parties. In the previous Uttar Pradesh election, in 2012, the BJP won only 47 seats. 2017’s vote marks a significant endorsement for Prime Minister Narendra Modi, the leader of the BJP, and the face of its campaign across state elections. Four other, smaller states declared results on Saturday: Punjab, Goa, Uttarakhand, and Manipur. In Punjab, India’s storied but declining Congress Party emerged victorious. The BJP took Uttarakhand and was vying for dominance in close races in Goa and Manipur as results continued to be firmed up. The state elections are crucial at national level because each state nominates a proportional number of representatives to India’s upper house of parliament. While the BJP has a clear majority in the lower house — won in 2014’s national vote — it is underrepresented in the upper house, which has stymied some of its reform proposals. According to Shailesh Kumar of the political risk consultancy Eurasia Group, the Uttar Pradesh result was a referendum on Modi. “Demonetization” refers to a shock move in November when Modi recalled all 500 and 1,000 rupee currency notes. Indian voters wait in line at a polling station in the Naini area on the outskirts of Allahabad during the fourth phase of Uttar Pradesh state assembly elections on February 23. The two high-value notes represented 86% of all cash in circulation in India. The surprise recall, and the subsequent release of new 500 and 2000 rupee notes, led to weeks of long queues at banks and ATMs across the country. At the time, Modi said the recall was aimed at cracking down on corrupt hoarders of untaxed cash. A number of reputed global economists, included Harvard’s Lawrence Summers and Ken Rogoff criticized Modi’s move as excessive. Voters celebrate outside the in Lucknow on March 11, 2017. The results themselves are not a great surprise, but the margin of the BJPs win in Uttar Pradesh is greater than predicted. However, even with the landslide win in Uttar Pradesh, Modi will still fall short of enough support in the parliament’s upper house, says Eurasia’s Kumar. Supporters of Congress wave their flags as they celebrate their candidate’s win in state assembly elections in Imphal, the capital city of Indis northeastern state of Assam, on March 11. Modi is also expected to double down on his plans to improve infrastructure. “He is now well positioned for 2019,” Kumar said, referring to the next national elections. India shows faith in Modi — can he now deliver? At a time of global anger against elected leaders, India’s state elections represent a vote of confidence for the country’s Prime Minister, as well as a much-needed boost of morale. Modi had previously lost an important election in Bihar, a state which shares a similar voter base to Uttar Pradesh. Modi also suffered in recent months with the chaos and fallout from his demonetization move. With a cutback in consumer spending and economic activity, economists had predicted a fall of as much as one percentage point in India’s growth rate. However, in India’s most recent GDP figures released last month, quarterly growth had slowed only slightly to 7%, which meant India once again edged ahead of China as the world’s fastest growing economy. Indian supporters of the Bharatiya Janata Party (BJP) celebrate outside the party office as state assembly votes are counted in Lucknow on March 11, 2017. While India is still seen as a developing nation, its size and speed of expansion underscore its massive importance to the global economy. According to the consulting group PwC, India accounts for about one-sixth of the world’s GDP growth. With Modi now firmly ensconced in power until at least 2019, and perhaps further ahead, the focus will now shift to whether Modi can deliver on his promises of rapid development.